The infrastructure needs of sub-Saharan Africa are expected to exceed US$93 billion annually over the next 10 years. Infrastructure is closely linked to economic growth and social progress, driving development through increased employment and trade and improved health. A lack of infrastructure, on the other hand, can severely impair a country’s growth and competitiveness, deterring much-needed foreign direct investment. According to the Africa Infrastructure Country Diagnostic, traditional sources of investment in infrastructure together contribute approximately US$45 billion per year, leaving a gap of US$48 billion per year to be financed. Infrastructure investment is closely tied to the pace of development; for every dollar spent on public infrastructure development, a country’s GDP rises between US$0.05 and US$0.25. The poor condition of infrastructure in sub-Saharan Africa cuts national economic growth by 2 percentage points every year and reduces productivity as much as 40 percent. Africa’s largest infrastructure deficit is in the power sector; more than 60 percent of Africans are not connected to electricity. Power consumption, at 124 kilowatt-hours per capita per year and falling, is only 10 percent of that found elsewhere in the developing world, barely enough to illuminate one 100-watt light bulb per person for three hours a day. These conditions risk the future of energy infrastructure and overall economic growth for Africa. Given current constraints on traditional sources of public and private financing, private-sector investment is increasingly needed for infrastructure projects. To generate ideas to expand energy infrastructure investment in the region, the Milken Institute, in collaboration with the U.S. Agency for International Development, convened experts from the public and private sectors for a Financial Innovations Lab in October 2014. 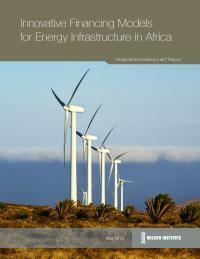 The Lab, titled “Moving Past the Barriers: Investing in Energy Infrastructure in Africa,” included senior leaders in private-sector energy investments, multi- and bilateral organizations, and corporations, along with representatives of financial institutions. Exploring ways to improve efficiency in transaction management and widen access to capital, they produced concrete solutions Africa can pursue now to close the significant funding gap.